Add efficiency to your storage areas with these high quality, low cost bin systems. 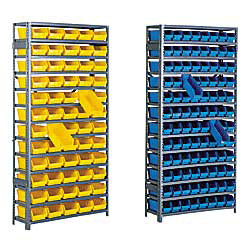 Racks are 36" wide with (10) or (13) shelves that are adjustable on 1" centers. Constructed of 16-gauge steel uprights and side braces, with 13-gauge steel back braces. Polypropylene bins have front label slots, finger grip, and reinforced ribs to prevent spreading. Bins are resistant to chemicals and oils, and will not rust or corrode. Units are 75" high with 400-lb. shelf capacity. SPECIFY BIN COLOR FOR 10-SHELF UNITS: BL - Blue, GN - Green, RD - Red, YL - Yellow. SPECIFY BIN COLOR FOR 13-SHELF UNITS: BL - Blue, YL - Yellow. IN STOCK.